We got the call about a favorable weather window so we went fishing. It started off as simple as that. Due to the kindness of the BFC members I have been able to experience some fantastic fishing and overall good times. This trip would be no different. Before any trip or major life event, I look for a few signs beforehand. I stay aware of what is going on around me and use these signs as a way to get an impression how this event ( read fishing trip ) will play out. Old man Wilkie and I left central Maine making our way to a friends house for the night before we would head offshore. The drive down was uneventful for us, not so for the owners of Toyota Camry we saw fully engulfed in flames. Sign number 1. We arrived at our friends home to relax before our 1:00am departure time. Wilkie had a beer and I walked around, taking it all in if you will. The bathroom was a bit of a mess and the chips we found were expired. But there was cool artwork on the fridge and fishing gear stashed everywhere. "These are men" I reminded myself.
" Real fishermen" I repeated. I'll take this as good sign number two. I slunk off for two hours of sleep and Wilkie and Capt. Lane planned our attack. They woke me early and we headed south. First a pit stop at the local McDonald's and some chit chat about tattoos with the young woman working the night shift. She showed us her piece and I took this as good sign number three. We arrived at the boat and met up with Alex The Russian and Massachusetts Joe, solid dudes mind you. Out of the harbor we motored looking for open water. I had never been offshore before and was not sure how many land legs would handle it. 20 minutes into our 4 hour boat ride I threw up, I caught most of it on my arm and shoulder. I kept this up for another 2.5 hours as Wilkie, The Russian, Joe and The Captain crushed beers in the darkness. With the sunrise came calm seas and guts, as we set our second line of the day the reel began to scream and we were into fish. Yellow fin began to stack up in the fish box. 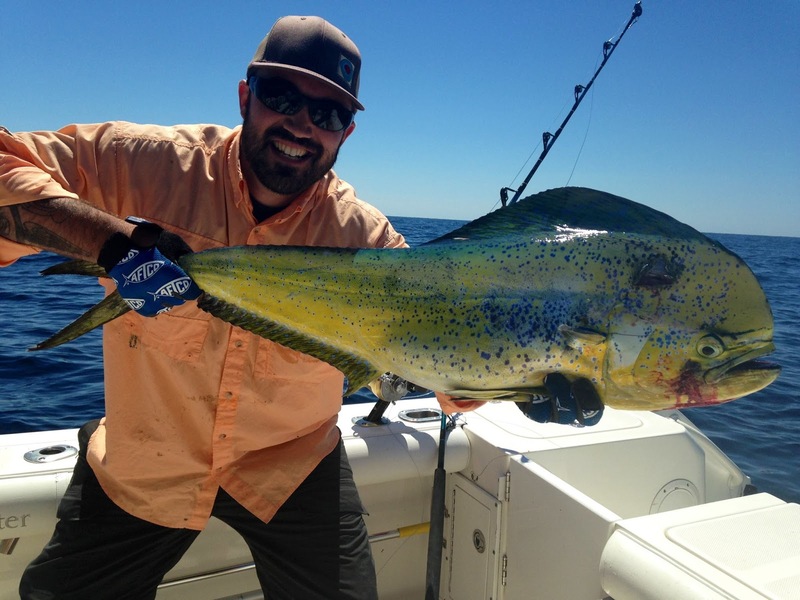 We even got into a few Mahi Mahi ! The Russian spotted porpoises, first a small pod and soon a pod of hundreds. Capt Lane pointed the OI right at them and almost instantly we were hooked up with triples. We bent the gaff on one of those Blue Fin. It is hard for a land lubber like me to describe the views 100 miles offshore. First, the water color is crazy. It is a shade of blue that is hard to describe, magical blue we'll call it. Warmer water welcoming fish and fisherman alike. It was a spectacular day, my thanks to all of those involved. Thank you to Captain Lane and crew. I can not fix the spacing of this post. I have tried from multiple computers. Any help would be awesome. jasper, i really enjoyed this post. i was trying to describe that "offshore blue" or "magical blue," as you say. it's a pretty wild scene out there when you reach the edge and that water temp/air temp/water color change. so what did the three signs add up to? some sort of messy, manly bite that was on fire? Jasper, an excellent post. It was also great to have you on the boat after a long time of anticipation. I must say that the card on my refrigerator came from Neil and the expired chips belong to Clark. The bathroom mess however, that's pretty much all me. Love the panoramic shot of the troll. Awesome. What a trip you guys had. So glad you banged 'em good out there - OI style. It doesn't always happen that way, but with ol' Capt. Lane at the helm, you've got as good a shot as any out there. I'm still sore that I missed out on such an amazing collection of crew - great fisherman - albeit not all gentleman! Great stuff. Jasper, you still jealous of that girl's ink? I can't stop lookin at it. Jesus that's a mess of fish.